PechaKucha Night Batavia is back! 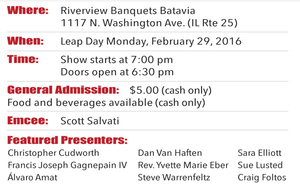 Volume 2, aptly named “Leapin’ Lizards” in honor of Leap Day, will be held on February 29, at Riverview Banquets, 1117 N. Washington Ave. (Rte. 25). Doors open at 6:30 p.m. The cost is $5 per person (cash only). Food and drink will be available for an additional charge (cash only). What is PechaKucha Night? It’s an evening of engaging presentations by a number of speakers in a fun, social environment. Speakers talk about a topic near and dear to their heart while 20 images (slides) are displayed for 20 seconds each. An emcee introduces each speaker and there is an intermission—called a Beer Break—when the audience can partake in any beverage, alcoholic or not, and food. To view presentations from PechaKucha Night Batavia, Volume 1, click on the image above. Scott Salvati of Lighthouse Marketing is the evening’s emcee. Presenters for Volume 2 include well-known Batavia businessmen Craig Foltos, owner of Foltos’ Tonsorial Parlor, and Steve Warrenfeltz, owner of Kiss the Sky; the Rev. Yvette Marie Eber, pastor, Congregational Church of Batavia; Sue Lusted, Valley Sheltered Workshop supervisor; writers Dan Van Haften and Christopher Cudworth; Aurora University professor Sara Elliott; Álvaro Amat, exhibition design director at Chicago’s Field Museum; and artist Francis Joseph Gagnepain IV. Their presentations promise to be informative, heart-warming, humorous, and thought-provoking. The idea of PechaKucha (or PK) Night was devised in Tokyo in 2003 as an event for young designers to meet, network, and show their work in public. The fun, lively events now take place in 900 cities around the world. Batavia’s inaugural PKN was held last October. To find out more about PechaKucha Night Batavia, including a list of menu items available on February 29, visit Facebook.com/PechaKuchaBataviaIllinois.